In the budding yeast Saccharomyces cerevisiae, five distinct MAPK pathways have been identified. These pathways regulate mating, sporulation, filamentous growth, cell wall integrity, and responses to osmotic shock. 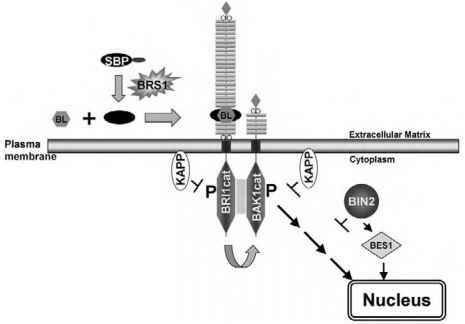 One of the first genetic screens for genes controlling MAPK revealed a functional redundancy, as several distinct phosphatases appeared to be important in the inactivation of a single target MAPK, in this case Hog1. Hence, double deletion of the PP2C serine/ threonine phosphatase PTC1 together with the tyrosine-specific phosphatase PTP2 is lethal, and this phenotype is reversed by inactivating components in the Hog1 MAPK pathway. This implies that in the double-phosphatase-mutant yeast the Hog1 pathway is constitutively activated. Subsequent studies revealed that the osmotic response MAPK Hog1 is regulated by Ptc1, Ptp2, and its homolog Ptp3, although Ptp2 appears to be the major regulator in this pathway . While Hog1 controls responses to osmotic stress, Fus3 is a distinct MAPK underlying pheromone responses in S. cerevisiae. When screening for gene suppressors of the yeast mating response, the VH1-like dual-specificity phosphatase MSG5 was identified as an inactivator of Fus3 activity . Importantly, MSG5 is also induced by mating pheromone, indicating that this phosphatase functions as a negativefeedback regulator of Fus3 actions. Subsequent studies revealed that Msg5 is not the only phosphatase regulating this MAPK, and that Ptp2 and Ptp3 also play a role, although, in contrast to the case of Hog1, Ptp3 appears to be more important. Figure 1 Schematic representation of protein phosphatases important for inactivation of MAPKs in yeast, worm, fruit fly, and human. Genetic and biochemical studies reveal that conserved members of serine/threonine, tyrosine-specific, and VHl-like dual-specificity phosphatases all play a role in inactivating various target MAPKs. Shown are specific phosphatase gene family members known to inactivate selected MAPKs. Powerful transcriptional induction of phosphatase genes, tight MAPK binding, and phosphatase catalytic activation, as well as regionalized subcellular localization, are emerging as important mechanisms for allowing tight and specific control of MAPKs by these various phosphatases (see text for details). As with Hogl, Fus3 therefore represents a further example of a MAPK inactivated by both a tyrosine-specific as well as a VHl-like dual-specificity phosphatase. In fact, it appears that Ptp3 is required for maintaining a low basal activity of Fus3, while Msg5 plays a major role following pheromone stimulation . It is of note that Ptp3, similar to mammalian MKPs, interacts with Fus3 via a cryptic CH2 (Cdc25 homology) domain, and this targeted binding is responsible for its in vivo substrate selectivity. Mutations in either Ptp3 or Fus3 that abolish this interaction cause a dysregulation of the Fus3 MAPK . When considering specificity of interaction, it is worth noting that although Msg5 does not affect Hogl activity it has been shown to act on a third yeast MAPK, Mpkl .